So I experimented with vloging for my very first time at Camp Wannaknowmore. What do you guys think? Should I create more vlogs from my travels and shoots? Let me know by commenting! I love creating recaps and reliving the Camp Wannaknowmore's Wedding Photography Workshop is giving me goosebumps. I had such an amazing time with everyone. We photographed, we shared, we did amazing goal and intention setting exercises - and above all made some solid friendships. There were also campfires and s'mores gallore! Riding Mountain was the perfect fall backdrop for a beautifully styled shoot created by Brit from Fache Florals. Man, she is so talented - I can't deal! 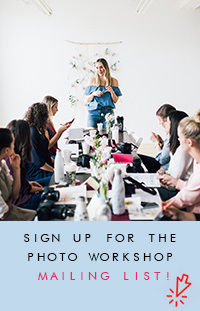 Thank you to Corey and Amanda (Cojo Photo) for asking me to come and co-host this workshop with Mike (Modern Pixel Photo). I had SUCH an amazing three days in my favourite place in Manitoba - Riding Mountain National Park!